Fire! It’s a phrase no barn owner ever wants to hear. Preventing barn fires is just one way to safeguard your family, horses, and belongings. In an environment filled with dust, wood, and other combustible materials, fire is a very real risk barn owners must be prepared to prevent. And, as with so many other aspects of our lives, prevention is the wisest strategy. Here are seven fire prevention best practices that can help reduce the risk of a fire that could harm your herd and cost you money. High moisture content within a hay stack has the potential to create enough heat to combust and cause a devastating barn fire. What’s more, that hay stack only needs to reach 150 degrees Fahrenheit to create a fire risk. Protect yourself, horses, other animals, and the barn by storing hay in an area with proper ventilation and good air flow to prevent the hay’s temperature from rising. 2. Use extension cords properly. Never use damaged cords, and always follow manufacturer guidelines regarding how many cords you can string together. Make sure your horses can’t chew or damage them either. 3. Don’t DIY electrical work. Electricity can make any barn more comfortable for humans and horses alike, but that convenience comes with a price. For example, a poor electrical connection can be a fire catalyst. If you need to install or repair electrical wiring or related components, hire a professional with experience working on electricity in barns. From fans to dryers, dirty appliances are more than inefficient; they also create fire hazards. Help prevent barn fires by wiping or blowing away grime regularly. If your tack room has a dryer, clean out the lint filter after each use. Keep all appliances well away from combustible materials, as well. 5. Always have fire extinguishers on hand. The Humane Society of the United States recommends mounting a fire extinguisher about every 30 to 40 feet in a barn. Have the extinguishers checked and recharged by a professional fire protection company once each year. You should also make sure that you and anyone else who uses the barn, from boarders to employees, understands when and how to use an extinguisher properly. 6. Consider installing a sprinkler system. A properly installed sprinkler system can save lives and property. There are two main types used in barns. A wet-type sprinkler contains water all the time, discharging it only when triggered by heat from a fire. In a dry-type system, water is stored in a pressurized tank. When a fire triggers the system, the sprinkler head opens to release the air pressure, allowing the water to flow. Always work with an experienced sprinkler company to ensure proper planning and installation. The combination of an ignition source and combustible material is always a recipe for disaster. Careless smoking is one of the leading causes of barn fires. One of the top ways to prevent barn fires is to prohibit smoking in and around the structure. If you or others who use the barn smoke, designate a smoking area well away from your horse haven. Build a safe home for your equine friend. When it’s time to give your horse a new home, talk with the Quarry View Construction team. 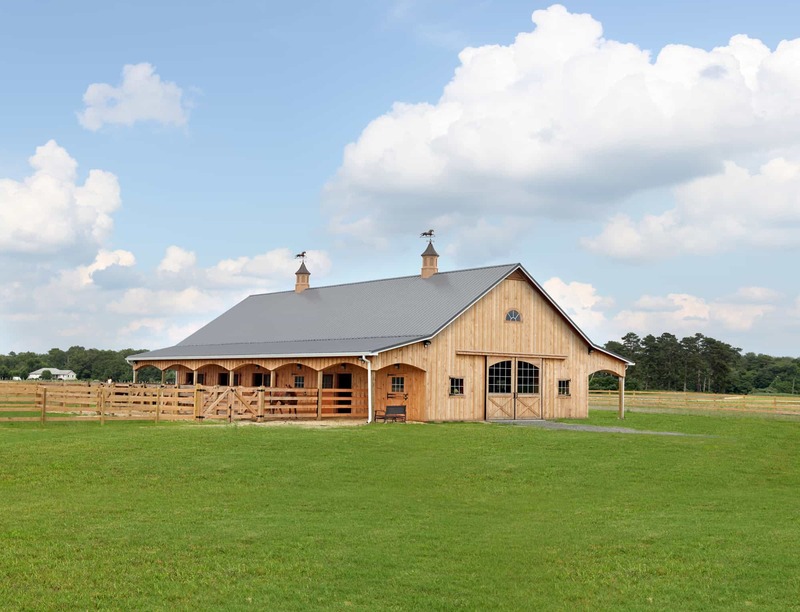 We’ll design and build a barn to your specifications to help maximize safety. Let us know how we can help build your dream barn.